We’ve added a “pages” tab to document viewers in our workspace and embedded on news sites. The new tab offers a birds-eye view of an entire document. This new tab, which now appears in your document viewer right next to the “document” tab, allows you to browse a document more quickly by showing you thumbnail images of every page. For long documents, this tab allows you to identify exactly where you want to go in the document without having to scroll and search repeatedly until you find a specific section in the document. The pages tab will help logged in DocumentCloud users find their way around documents they’ve uploaded; it will also appear in documents embedded on your news site, so your readers can see the document thumbnails as well. 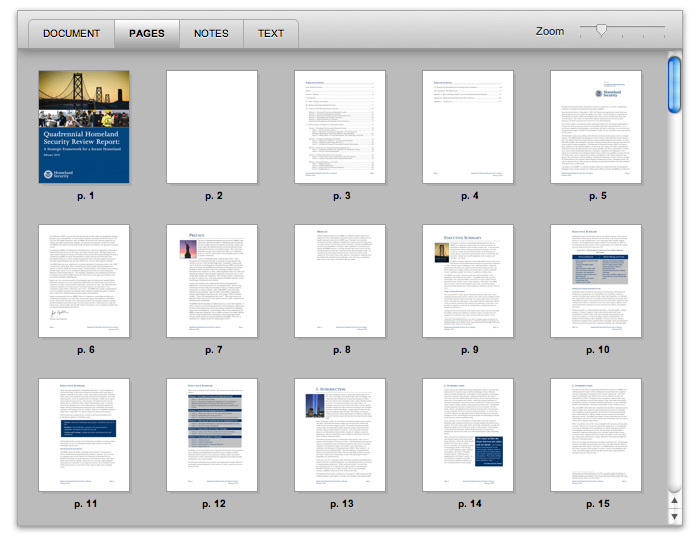 Take a look at the pages of this Department of Homeland Security strategy document: you can use the zoom slider to enlarge the page images or select any page to jump to that location in the document. The pages tab is especially handy for browsing slideshow-style documents — instead of scrolling the entire slides, you can quickly scan to the section you want to read. Here are the first few pages of the State Department’s Diplomacy and Development Review, as embedded by Washington Post alongside their piece on the report. We built this new pages tab not only to help you access information in a document faster, but also as a foundation for the document modification features that we’re planning to roll out next week. Look forward to using it for to re-order, insert and remove pages in a document. If you have used the “Download Document Viewer” option to download and host the whole viewer on your own server, you will need to download a new viewer package if you want the pages tab in your viewer. If you have any feedback about the pages tab we’d love to hear from you.